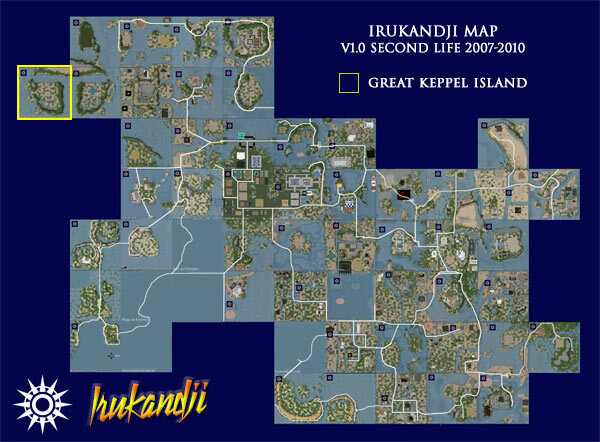 Great Keppel Island is the western-most region in the Kingdom of Irukandji, and is part of Jillaroo State. Terraforming is a direct mirror flip of the neighbouring Yeppoon Atolls sim. A single landowner leased both regions. Only two islands adjoined Great Keppel Island. Northeast lay Tuvalu Straits, with Yeppoon Atolls immediately east. Great Keppel Island takes its name from the real world island of the same name in Central Queensland, Australia. The region's life was unfortunately short and no photographs survive except the aerial map above.